Sandwiches are some of the easiest things to assemble for a quick lunch, but they needn’t be boring, soggy and blah. The trick for some sandwiches (the ones with sauce and other liquid substances) is to keep the bread / wrap away from the filling until you are ready to chow down. 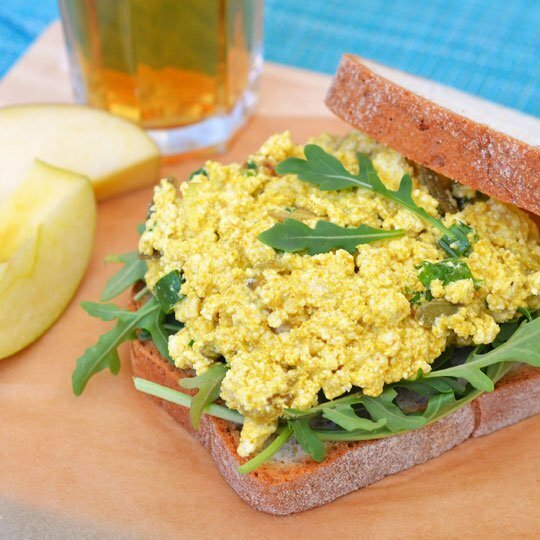 If you love an egg mayo, this is a really good vegan version of it — a blend of spicy and sweet thanks to the curry powder and golden raisins, with a good amount of punch from the mustard seeds, chopped scallion, parsley and freshly ground black pepper. You probably wouldn’t even think about boiling eggs anymore since tofu is so much easier and tastes just as good. Fill into whole grain bread, wrap, or mix into salads. Full recipe here. One glance at the name and you know this is a gourmet sandwich to die for. Pick up all the ingredients at your local delicatessen / supermarket and you’ll be in for a fabulous lunch. 100% of people who tried this recipe would make it again. Have it with a side salad for a balanced meal. Recipe here. This is super easy as it uses canned salmon, but if you want you can also grill up your own salmon fillet and then flake it up, then proceed with the recipe. Cream cheese is the soul mate of salmon and goes beautifully with the minced red onion, lemon juice, freshly ground pepper and extra virgin olive oil. Stuff with plenty of tomato slices and lettuce for a crunchy, flavourful munch. Recipe here. Green egg salad anyone? This is an extra special egg salad, and extra creamy too thanks to the mashed up avocado. You’ll see no sign of mayo in this recipe as it uses Greek yogurt and avocado instead to cream up the eggs. It’s all the lusciousness, without any of the guilt! Recipe here. 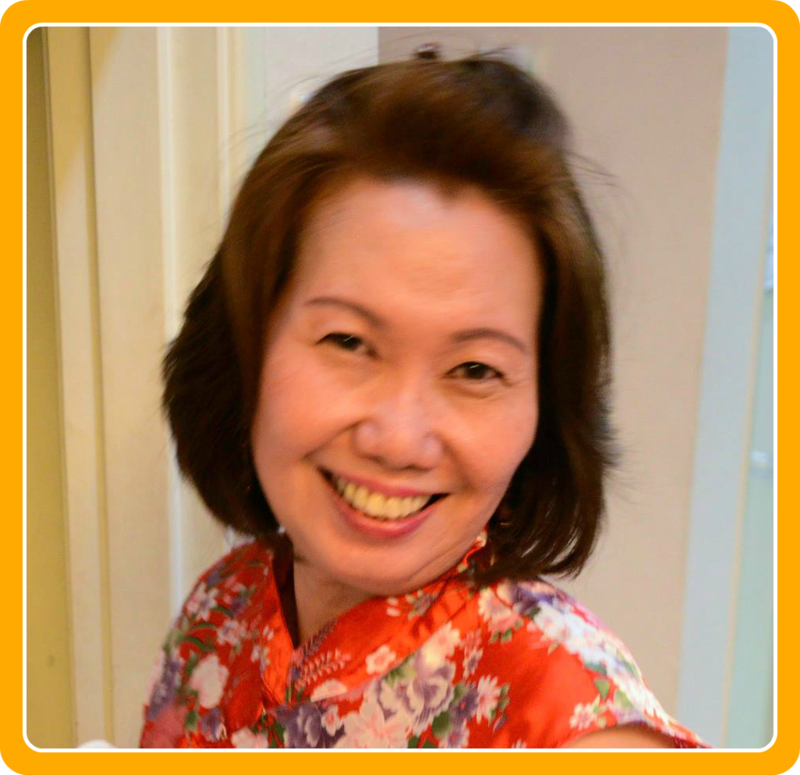 You’ve grown up eating these and they may seem like nothing special, but sometimes a taste of mom’s cooking is like a warm ray of sunshine in a cold air-conditioned office. This recipe keeps it simple with the traditional canned sardines, along with red onions, red chilli and kalamansi lime for flavour. We suggest you use whole grain bread though. Recipe here. This one requires a bit of work ahead of time, but once you got the spicy chicken done, you have enough for LOTS of sandwiches (hint: store the chicken in the freezer in individual packaging and pop one out whenever you need!) The recipe calls for lettuce wraps so if you’re watching your carb intake, this fabulous recipe is for you. 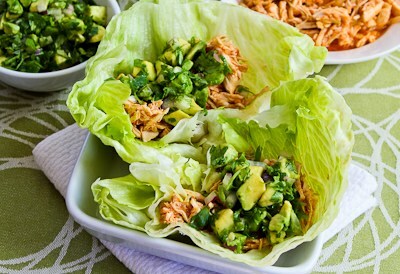 The avocado salsa adds lots of flavour and creaminess and balances off the spiciness of the chicken which makes a great filling for any boring old lettuce! You can also use this in a regular sandwich we reckon. 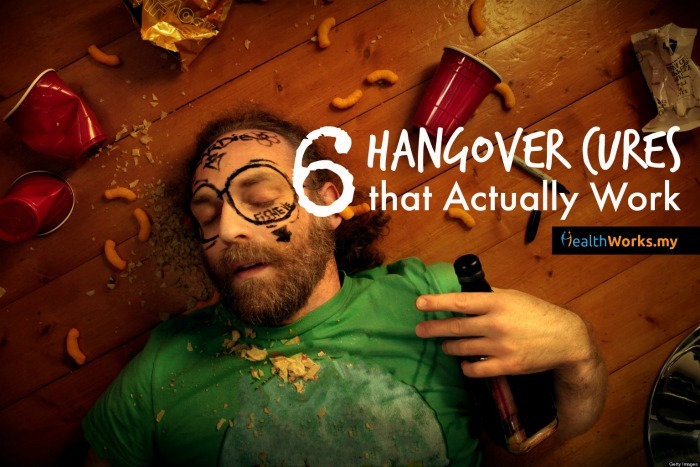 It’ll just be a lot messier. Recipe here. Another sandwich that wouldn’t look out of place in a trendy cafe. 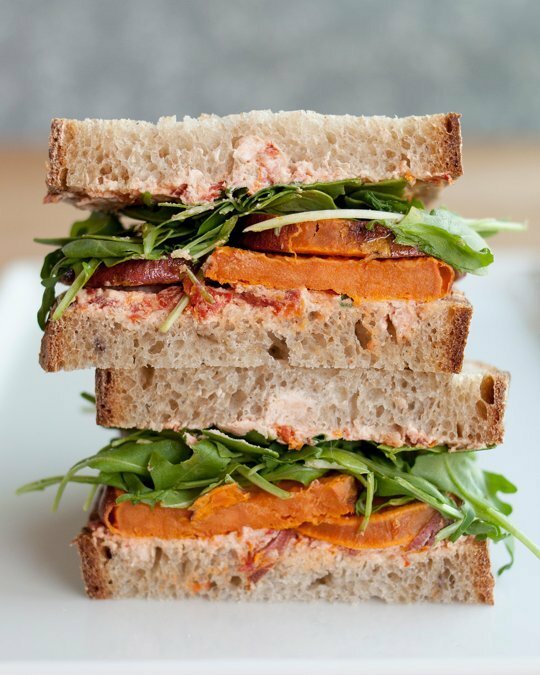 You wouldn’t imagine that sweet potato would go so well with goat’s cheese and arugula, but it does! And the addition of chopped up sun-dried tomatoes into the cheese? Absolutely brilliant! Make this for a special lunch, maybe like the day after you got a promotion or a raise, or something special. Yes, it’s that good. Recipe here. 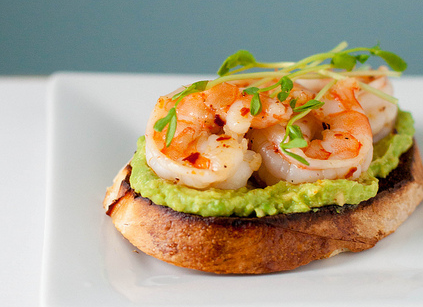 Shrimp cooks fast and tastes great, and when paired with a guacamole makes for a magnificent meal. Top with lots of sprouts for maximum satisfaction! Recipe here. Chickpeas are packed with protein and make great filling for sandwiches and wraps. And this recipe is as easy as it gets with chickpeas, celery, onion, lemon juice, cider vinegar and a dash of salt and pepper whizzed up in a food processor. Voila, lunch is ready! Recipe here. This is so easy we could hardly call it a recipe. All you need is a sliced up avocado, lettuce, sliced tomatoes, some salt, pepper, and mayo. Spread the mayo on a toasted slice of bread, layer on your avocado, lettuce and tomato and there you have it, your ALT’s ready. If you’re craving for meat, ham would do lovely in this too. Recipe here (only if you really need it). This recipe ups the ante on regular chicken salad by adding in a creamy blue cheese! Use rotisserie chicken from the supermarket to breeze through this recipe. Chopped celery add crunch while light mayo and fresh lemon juice balance off the strong blue cheese flavour. Sprinkle in some dried cranberries if you want a bit of sweetness in your sandwich. Recipe here. 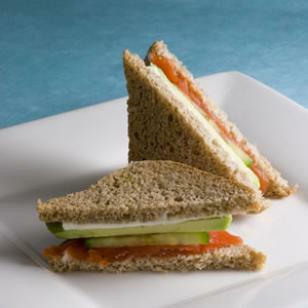 Sliced cucumber, smoked salmon and avocado come together for a dance on your taste buds. Easy to prep, but a great treat on the palate. Recipe here. You’ll need fresh mozzarella for this otherwise it’ll just taste blah. Smashed avocado with sea salt and freshly ground pepper goes amazingly well with some creamy mozzarella. Recipe here. Pesto makes anything better, even boring old chicken breast. Get your roast chicken from the supermarket, chop it up and toss with pesto, diced mozzarella and other veggies of your choice for a flavour-packed sandwich. Recipe here. 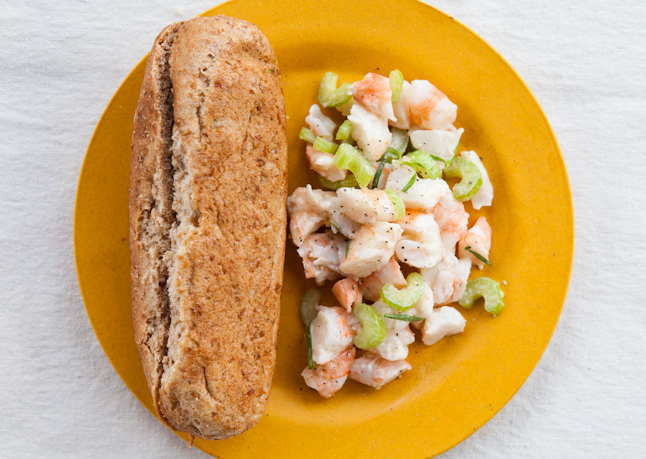 Fry or boil up some shrimp, toss with mayo, lemon juice, chopped celery, tarragon and black pepper for a seafoody lunch. Recipe here. 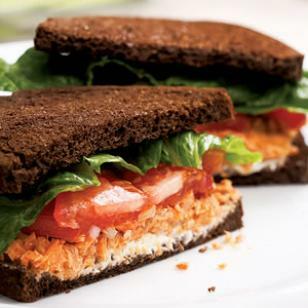 If you have some leftover hummus lying around, this recipe makes a great sandwich. It adds some substance to an otherwise veggie-laden sandwich filled with sweet onions, carrots, radish, sprouts and sesame seeds. Recipe here. 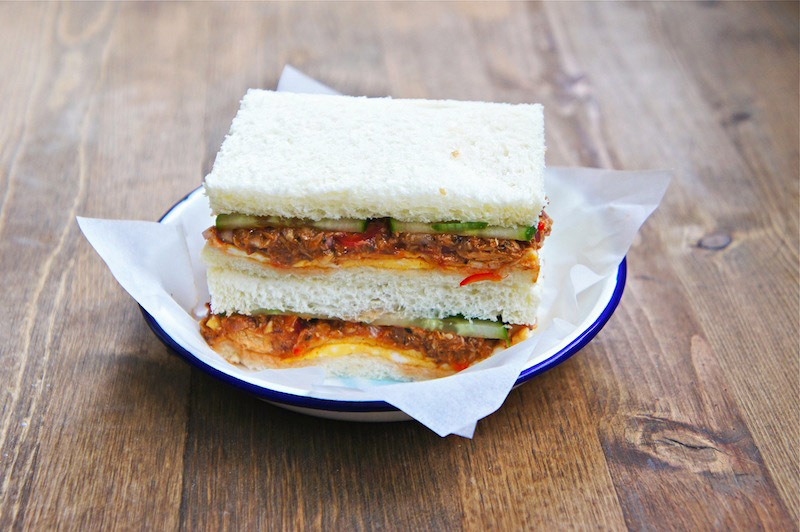 This requires barely any cooking skills but dishes up a pretty delicious sandwich. Onions are pickled in red wine vinegar while you prepare the asparagus in a skillet and the eggs are boiled. Recipe here. Instead of the traditional pork, this recipe uses lean chicken for healthy measure. 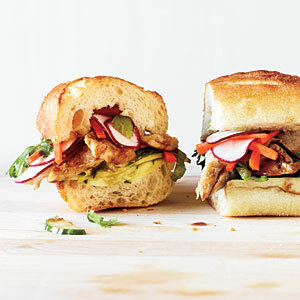 But you’re mistaken if you think that detracts from the original deliciousness of a banh mi. 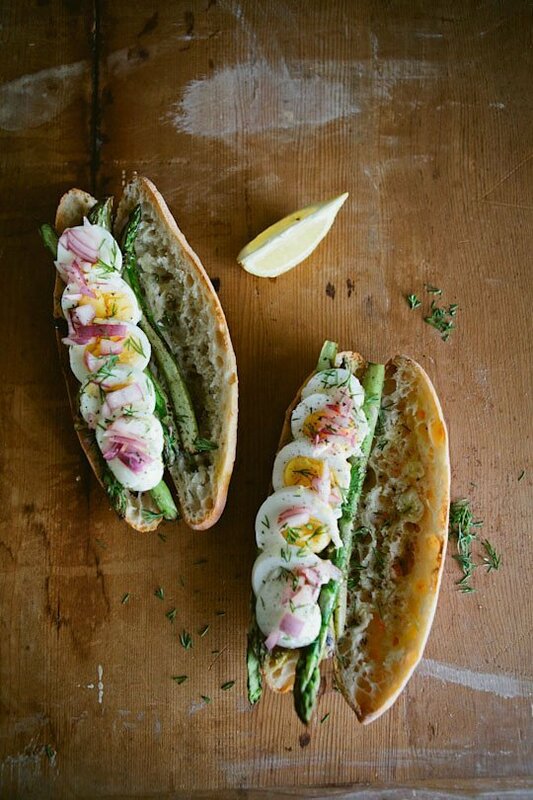 Lots of spices and herbs go into this sandwich to create a fresh, flavourful lunch that’ll brighten up your day. Recipe here. Tangy greek-yogurt and grilled eggplant makes quite a good match, along with some fresh oregano, sliced onion and arugula. Recipe here. 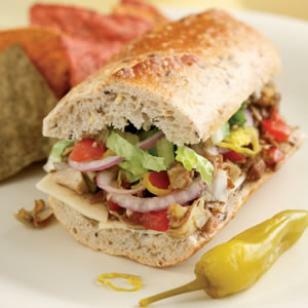 This delightfully easy, and somewhat messy sandwich packs a punch with sweet balsamic vinegar, artichoke hearts, red onion, cheese and pepperoncini. It’s like salad in a sandwich. Recipe here.